I’ve jut finished reading the biography of Steve Jobs by Walter Isaacson. It’s a good read about the man who built and rebuilt Apple. This post won’t try for any deep insights, no “he was a brilliant but flawed individual, blah blah blah”. It’s merely intended as a small list of key lessons from a successful dude. A players don’t like to work with B or C players. Only hire A players and get rid of the rest. integrated operations are very important in helping the company operate as a unit. Pillars block teamwork. Avoid the mistake Sony made with the iPod. there is no such thing as a single person having all the ideas. you aren’t Steve jobs. You can’t get away with shouting at people. creativity is a discipline too. It takes hard work. Users appreciate a great experience. You must have end-to-end elegance in design. There may be others, but that’s a decent list of learning points. By admin on August 27, 2013 | Strategy | A comment? If you’re getting the irritating “We couldn’t find what you’re looking for” error, it can be frustrating to fix. Ultimately I had to fix the problem from outside of Outlook. 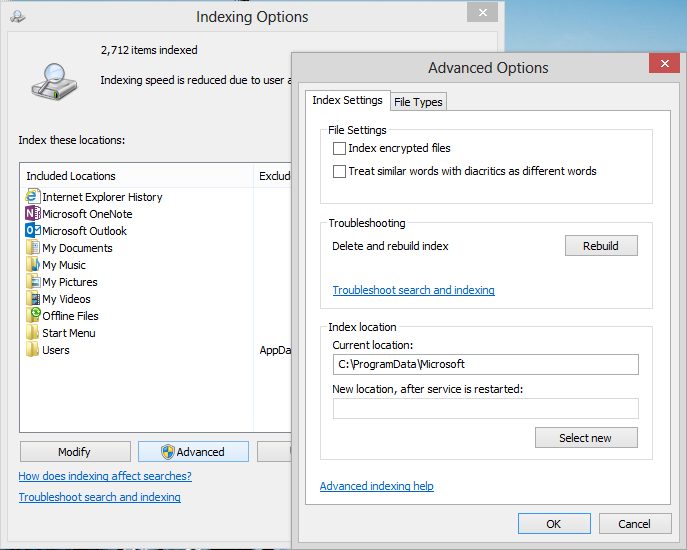 I went to my “Change how Windows Searches” option dialog and rebuilt the index. I tried the exact same thing from inside Outlook but nothing ever happened. Important: Before getting this to work, I also removed Outlook as an indexed location, restarted my PC, and then re-added it. However, this only partially helped, and there was still stuff missing from the index. By admin on January 2, 2013 | Uncategorized | A comment? This is as much for me as for anybody else, but I hope visitors to this page find it useful. Obviously, you can always try SharePoint’s standard verbose logging, but I’ve never found that to be terribly useful for search. You might consider trying to use Fiddler2, the same way you would with SharePoint 2010. SharePoint Blues has a good overview on how to turn this on. The steps for 2013 will obviously be different. No entries yet, but since they’re web services you can write on your own, debugging them shouldn’t be intractable. There’s an interesting post on the MSDN forums that is worth a read. It indicates there is no more FIXML, and that the index is stored in a binary format. Microsoft is apparently creating a tool to inspect the index but who knows how long that might take. There’s a query tool written by somebody at Microsoft which looks quite handy and is compatible with SharePoint Online as well. Ideal when you can’t login to the server. You can get it from CodePlex. This looks very similar to the MossMan query tool in SharePoint 2013. You can’t directly login to the server. You want to see what the index knows about a specific document. What specifically the query server sent back to a specific query submitted via the browser. There’s a suggestion in this deck by Agnes Molnar (SharePoint MVP) that you can use the developer dashboard, but there’s no more detail than that. Looks promising though, at least in a pre-production environment. By admin on December 1, 2012 | search, sharepoint 2013 | A comment? There’s a defect whereby your search results in SharePoint will not have document icons if you’re using FAST for SharePoint. This will happen to you, whenever you’re using a Document Library created from a custom Document Library template (i.e. Type != 101). The problem is that the contentclass of documents from custom libraries indexed by FAST in is not compatible with the way the Core Results Web Part determines which icon to display. Under normal circumstances, FAST allocates documents a contentclass of STS_ListItem_DocumentLibrary and when search results are returned to the Core Results Web Part as an xml document, our document is accompanied by an imageurl element which points to an icon within the layouts folder (i.e. /_layouts/images/icdocx.png). When using a custom document library, let’s say with a type of 15000, the contentclass will be STS_ListItem_15000 and the Core Results Web Part will be returned an imageurl element of /_layouts/images/STS_ListItem16.gif. This has been accepted as a bug by the product team. Unfortunately, So far as I know, it is not likely to be resolved in either upcoming hotfixes or Service Pack 1 (I have no visibility of any future CUs or Service Packs). The Microsoft-recommended workaround is to create a Custom Pipeline Extension whereby library items that have a contentclass of STS_ListIem_<a number> are converted to STS_ListItem_DocumentLibrary. I’m checking into whether I can post some PSS-provided sample code for the pipeline extension, but until then, visit this page on MSDN to get instructions on how to create one. Update 21 Sept 2012: Baastian Kortenbout has provided code which addresses the issue. 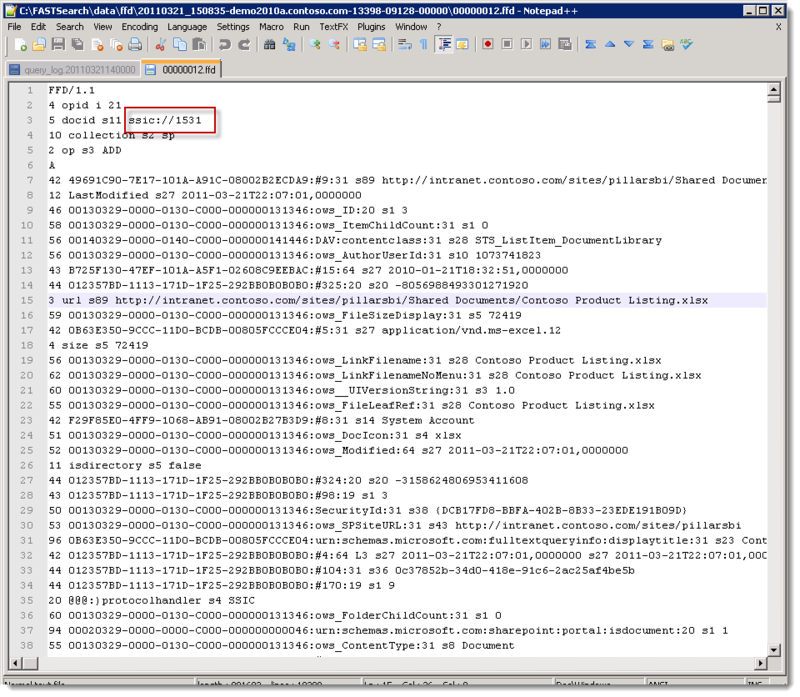 This can be downloaded here: FS4SP2010PipeLineExtensionIconFixer. I make no guarantees about the code, you assume all risks and responsibility should you chose to use it in any way, blah blah blah. By admin on April 14, 2011 | FAST, Presentation, Sharepoint, sharepoint2010 | A comment? There are more out there, but these are the primary tools I use when working with FAST for SharePoint. 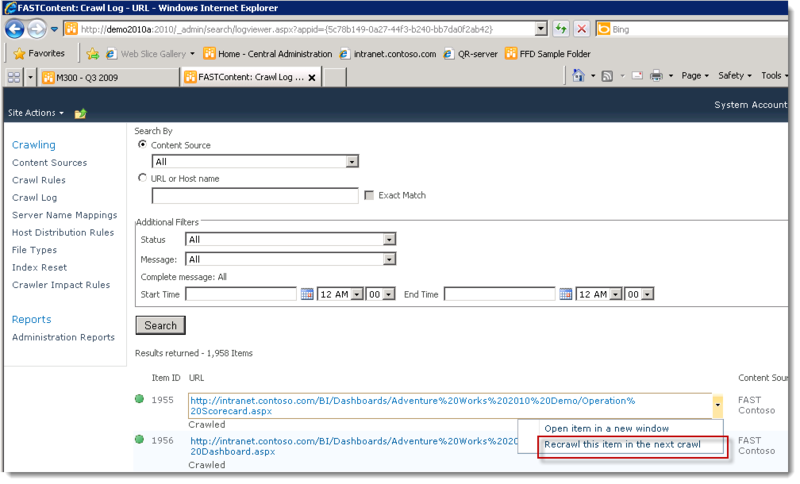 QR Server debugging queries >> Use this to inspect queries coming from SharePoint to FAST. MossMan FAST Query tool >> A handy little tool which allows you to build queries yourself, and interrogate FAST. Useful when writing custom FAST control. PowerGui >> IDE for working with PowerShell. Invaluable if you’re working with PowerShell for a longer period of time. FAST Query Logger >> A new tool which makes working with the QR Server significantly easier. Previously I blogged about the QR Server, my first port of call whenever I need to debug FAST. At that stage I ask the question “What does FAST know about this document?” and the QR Server is the best place to start looking. As part of this process it is critical to understand the difference between Crawled & Managed Properties. A Crawled Property is something that is fed into the FAST document processing engine. It may or may not decide to index and keep what it finds. If the information it does is not ignored it will end up in the Full Text index, a Managed Property, or both. Crawled Properties à What FAST is told, Managed Properties à What FAST knows and has decided to keep. While the QR Server is for managed properties, you use a tool called FFDDumper to inspect crawled properties. There is a file in your FAST installation folder called optionalprocessing.xml (found under %FASTSEARCH%\etc\config_data\DocumentProcessor\). This file is for configuring optional processing pipelines (duh!). Find the element that looks like the one below and set it to yes. THIS WILL SLOW DOWN YOUR SERVER AND GOBBLE DISK SPACE! Use this for temporary debugging only, and really, only use it for incremental crawls or else the sheer volume of data will make it very difficult to find what you want. 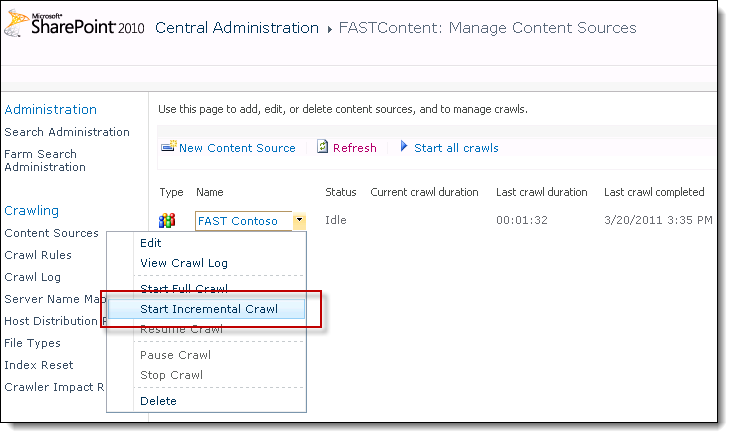 In SharePoint navigate to your FAST Content Service Application and mark a single document for a re-crawl. Alternatively, make a small change to a document (make sure the document is published). Kick off an incremental crawl by going to the context menu of your Content Source. If you navigate to %FASTSEARCH%\data\ffd you’ll find one or more folders. Go to the newest folder and look inside. There should be a few .ffd files, one of which will contain the ssic of your document (you can get this from the QR server). Only lines with GUIDs are available to be mapped into Managed Properties. Lines without GUIDs are internal to FAST and are not accessible. If you look at the screenshot below, the unfortunate implication is that you can’t write your own pipeline extension to run against the raw crawled data. I’ve recently created a new SharePoint site collection but was missing the FAST features out of the Site Collection Settings. I had a site collection within the same Web Application where the features were present and so was very confused. I already had added myself to the FASTSearchAdministrators and the FASTSearchKeywordAdministrators groups on my FAST server which can also keep the FAST options hidden, and besides, I already had them visible elsewhere. At this point I got the standard SharePoint error popup with the message FAST Search site collection features are not activated. Pretty obvious what’s going on, the feature isn’t activated and there’ s no obvious way to do so via the UI. Digging through the API using Reflector reveals this method which any reasonable developer can infer will give you the error message above. A little more use of Reflector gets you the GUID for the FAST Site Admin Feature (5EAC763D-FBF5-4d6f-A76B-EDED7DD7B0A5). Armed with this guid you can get the Feature definition. You don’t need it, but it’s interesting regardless (I’ve never seen this available via the UI).